I’m not much of a whiz in the kitchen. I can cook the basics and I can even make a few things very well. But I lack inspiration and follow through for new recipes. Even when I find particularly interesting recipe, I lose motivation when I find I’m missing ingredients or that I need to buy big quantities of something I won’t fully use. 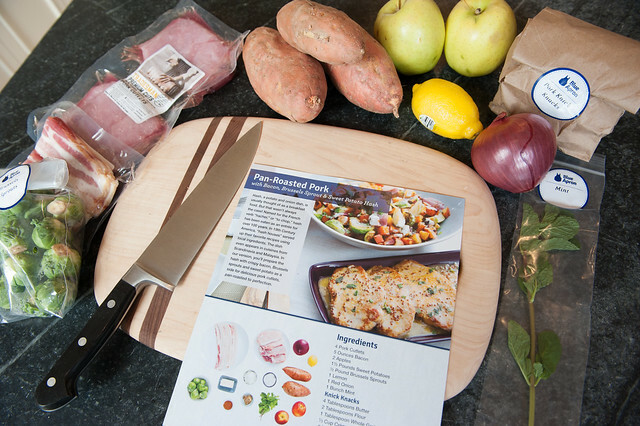 Enter Blue Apron – a recipe + ingredient service that will deliver everything you need AND inspiration right to your doorstep. I just love the idea and had to give it a try. I came home from work on Friday to find my Blue Apron box waiting for me stuffed with fresh ingredients to make Pan Roasted Pork with Bacon, Brussel Sprouts & Sweet Potato Hash. Yum! Because everything you need was right in the box, I got to skip the grocery store and the general searching through my cupboards for ingredients. Score one for Blue Apron. The perfect quantity of each item is already included in the pack so there was no wasted food. Score two for Blue Apron. The included recipe is printed on a large, glossy sheet that clearly walked me through each step with photos. Score Three! 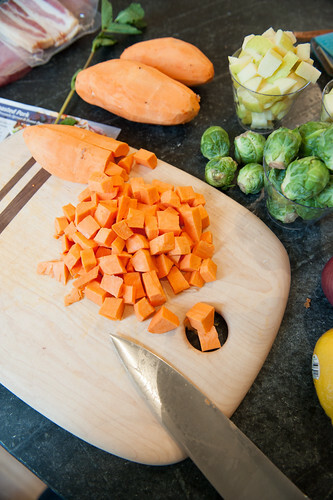 The prep is essentially just chopping those fresh vegetables. The hash called for cute, evenly sized cubes of sweet potato and apple which I was completely incapable of creating but thankfully had absolutely no ill effect in the taste of the dish. 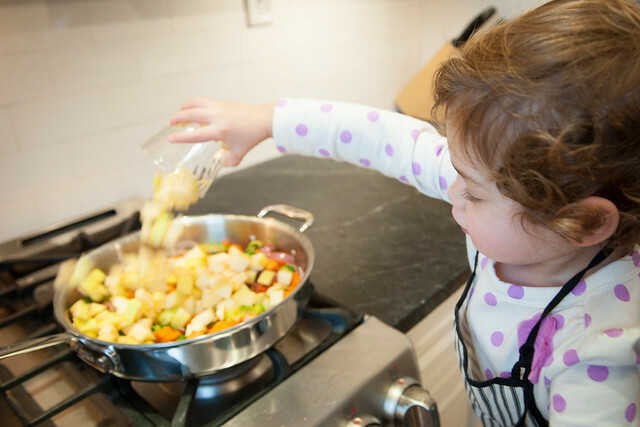 While my daughter is too young to be left to her own devices with sharp knives, I think this would be the perfect activity for older children to help in the cooking. Time for the heat. 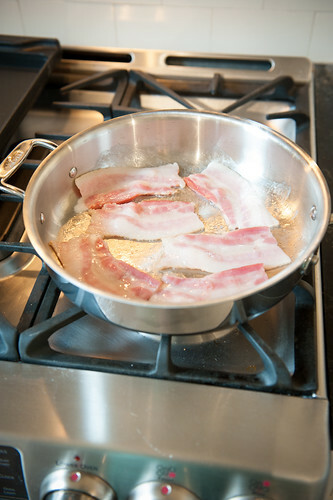 Mmmm…bacon. 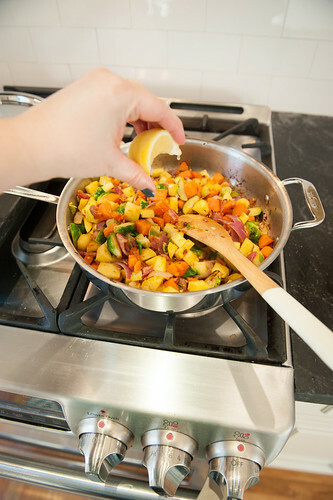 Then sauté the vegetables and add the spices. Here is where I let Aggie “help” by throwing in the chopped vegetables. Naturally she loved it. 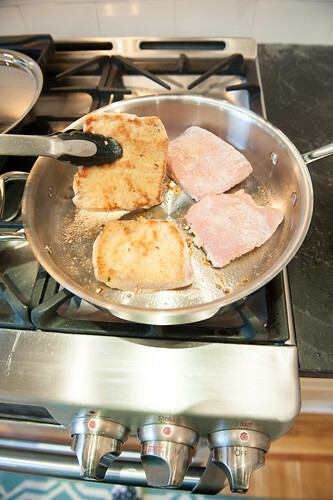 While that cooked, pork chops got under way. The proteins were perfectly portioned (why don’t supermarkets package their proteins this way??) . 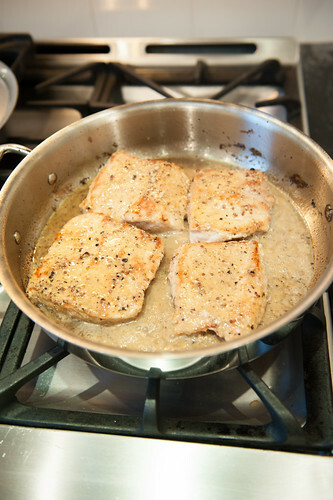 The last stop is to complete the sauce and put the chops in to simmer for a few moments before serving. The only things I needed to pull from my own cupboard was a few dashes of salt + pepper and a tablespoon of olive oil. But you know what they say about the proof of the pudding being in the eating? It was tasting time. Success! Really quite delicious. I was worried it might be too spicy for my tastes but it really was a very good flavored dish. 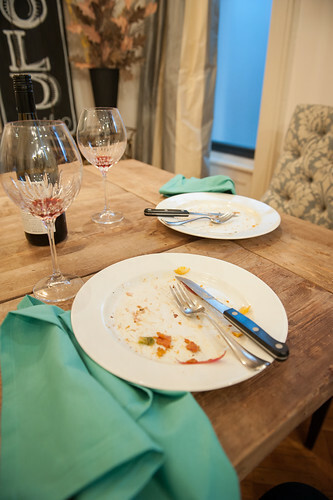 The portions were generous without being wasteful and the meal was balanced and healthy. Something I would have never dreamed up myself but was wholesome and tasty while also being a bit special. 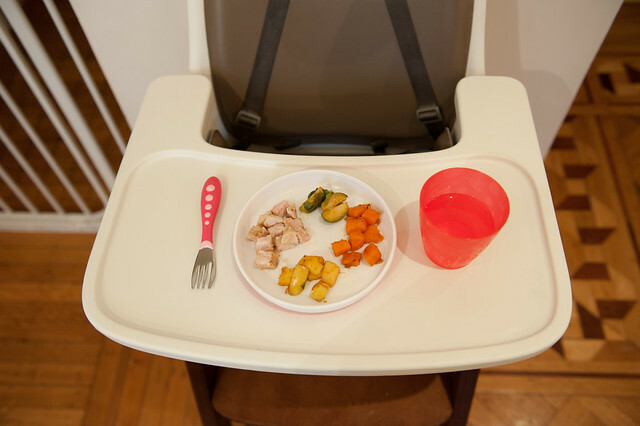 I should also mention that this particular meal was very child friendly in that it was easy to separate into toddler friendly portions and had a lot of familiar flavors for picky eaters. Added bonus was learning a new recipe and a few new techniques that I could incorporate into my repertoire more easily now that I had tried it. Score four, five and six Blue Apron. 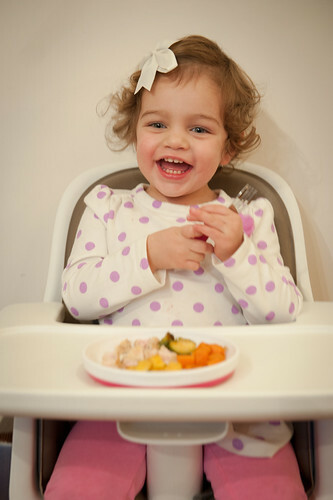 As you can tell, I really enjoyed the product and I can’t wait to try it again with a new recipe. The Brown Butter Gnocchi and the Roasted Cauliflower look especially appealing. 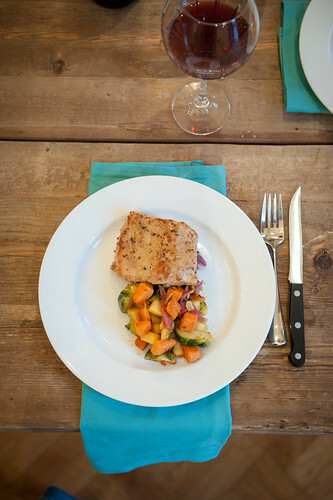 Thanks to the lovely people at Blue Apron, they are giving the first 50 readers 2 free meals off their first off. A great discount if you want to give it a try. Disclosure: This post has been sponsored by Blue Apron but all opinions expressed are my own. It looks good and healthy. It really was. I'm not usually a big fan of sweet potato but this was really good. The bitterness of the brussel sprouts really balanced the sweet potato nicely. This looks and sounds great! Thanks for trying this and letting us know. I'm in! This looks amazing! I am pretty sure they won't deliver the boondocks, but I really love the idea of a service like this. While I kind of like to cook, I cannot stand grocery shopping and struggle to come up with new ideas for meals. Thanks! I'm not sure where they deliver to but its pretty easy to check it out on their site by entering your zip code. You never know. You had me at bacon. 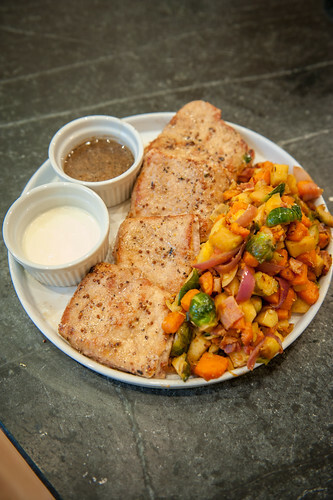 The food (and your plating) looks delicious. I like brussel sprouts but never know what to do with them. What a fun way to use ingredients you wouldn't normally use. 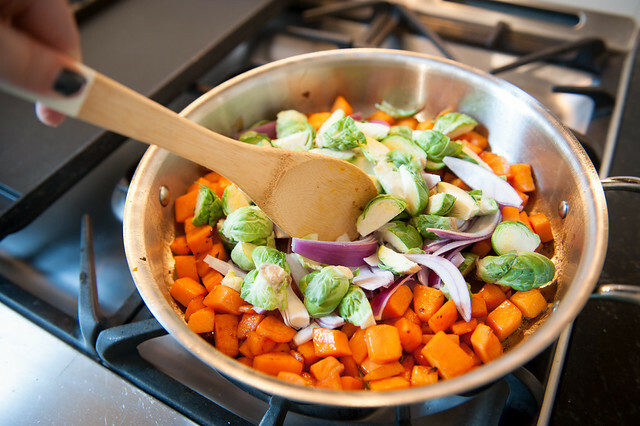 Oddly I really like brussel sprouts when they are roasted in the oven (they get a great caramelized flavor and they are super easy to make) but I never even tried them until I was 30 years old. I had always assumed they would taste like cabbage (which I do not like at all). Thankfully I tried them finally and totally dig them. Thats why i want to try the roasted cauliflower recipe I linked to above. I dont liked boiled caulliflower at all but I think the roasted kind might be really yummy. Great post! 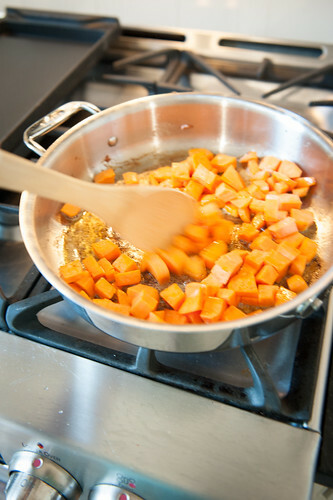 Since I'm the primary (read: only) cook in our family, I oftentimes find myself in a "rut." This looks like a fresh, convenient and unique way for me to get out of that rut and become more inspired in the kitchen. I've signed up on their waiting list as they are not in Dallas yet. 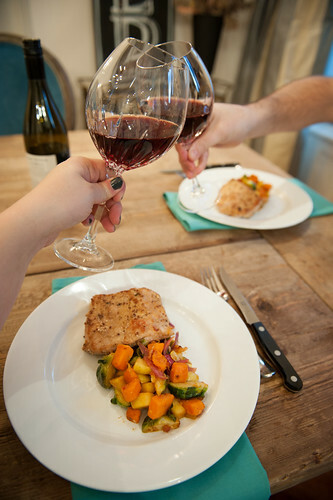 My brother and sis in law have been cooking with Blue Apron pretty regularly now. 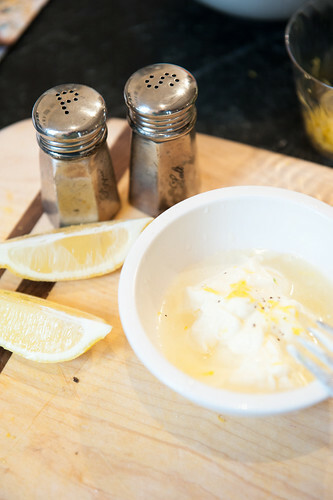 They say it is so easy, delicious, healthy and relatively inexpensive. Thanks for sharing your pics! I must now give it a whirl! Oh wow this looks yummy and easy to follow. Love that it's not wasteful at all. Thanks for the 411. Must give it a try. I thought I left a comment... If this is a duplicate sorry. What I wanted to say was this was a great post. I love this concept! Everything looked delish and easy to follow! This is a great concept and the pictures shows everything to be fresh and delicious.  I signed up on Friday and received the Brooklyn Limestone discount. I get my first Blue Apron delivery on February 11th. I do not eat meat, so I chose the vegetarian option. I like that you can put your subscription on hold when you need to. I am very excited about this and hope it works out for me. My food box will be delivered to my workplace. I don't want it left on my front doorstep. Thanks for the review! I'm going to give it a try. I gifted a subscription to my Dau and SIL; they love it!